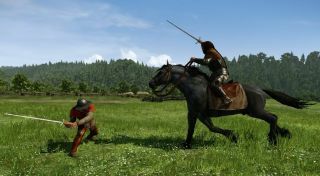 Warhorse Studios says the medieval RPG Kingdom Come: Deliverance is going to be considerably larger than it had originally planned. Unfortunately, that also means it's going to take a little longer to get the thing finished. Speaking in the latest video update, Daniel Vavra of Warhorse said the upcoming alpha, expected to be released within the next three months, will be a big one. It will incorporate most of the game mechanics and key features, including combat, horse riding, and stealth, and be set in a slightly bigger part of the world, with another big quest and "most likely" some cut scenes. He also demonstrated a new lockpicking minigame and several segments of voiceovers, and explained that the Kingdom Come: Deliverance beta will be handled in a fashion similar to that of Wasteland 2, with the first portion of the game being offered through Steam Early Access. "Now, the not-so-good news... We originally said the game was going to be released by the end of the year or [in] the first month of 2016," Vavra said. "At the current stage, we realized that we will need a little bit more time, so the current plan is to release the game a few months later, most likely in the middle of ." Some aspects simply aren't coming along as quickly as expected, particularly with regard to quests, he explained. "We planned to have about 100 quests, it's a lot more than we planned originally, and it will take a little bit more time." Vavra touched on a number of other topics in the video, including plans to sell merchandise including hats, t-shirts, and beer (four different kinds!) through an online Warhorse store. But the absolute best part is at the 18-minute mark, when a dude actually gets hit upside the head with an axe IRL. Prague clearly takes a loose approach to health and safety legislation, but trust me it's worth sticking around for.